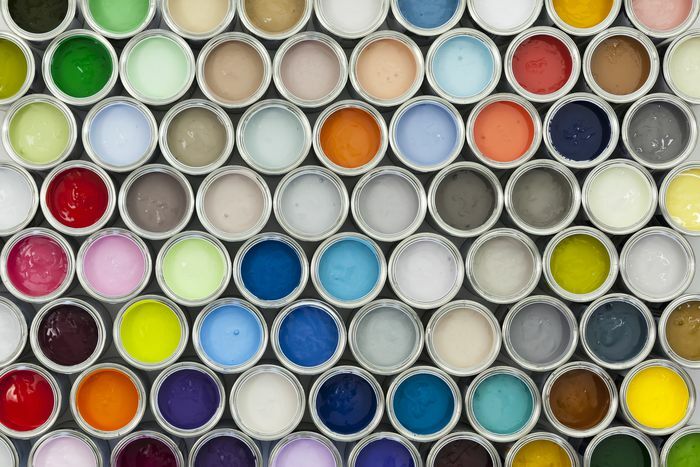 Each year color authority, Pantone announces a breathtaking collection of shades destined to inspire how we decorate our homes. The company's top pick for 2018 is Ultra Violet, and we could not be more excited. The energizing hue has a spirited yin-yang vibe that blends the soothing stability of blue with the fiery vigor of red. Even better, the gorgeous color complements a wide range of cool and warm shades. To help you explore a rainbow of options here is how to work Ultra Violet in every room in your home. Combing Ultra Violet with red is a rule-busting décor trick that beautiful works. Typically interior designers work with contrasting hues and monochromatic color schemes. But in this bohemian living room by Anouska Tamony pairing the two shades, which sit next to each other on the color wheel, has a dramatic impact. In this small space by the interior design firm, M House Inc., an Ultra Violet rug anchors a living room with a mostly neutral color scheme. This colorful bedroom is a modern mix of minimalism and maximalism according to Black Lacquer Design. The firm, which designed space, turned a wall in the bedroom into a floor to ceiling abstract painting. The violet bedspread is the accessory that pulls all the hues in the room together. Not ready to drink the entire pitcher of violet Kool-Aid? Consider using the shade sparingly. Here the hue adds a surprising bolt of color to a cupboard in a home by Claudia Pelizzari Interior Design. Decorating a tiny apartment has its challenges, but that does not mean you have to stick with neutral colors. In this micro abode spotted on 6sqft, violet walls are topped off with geometric wallpaper. 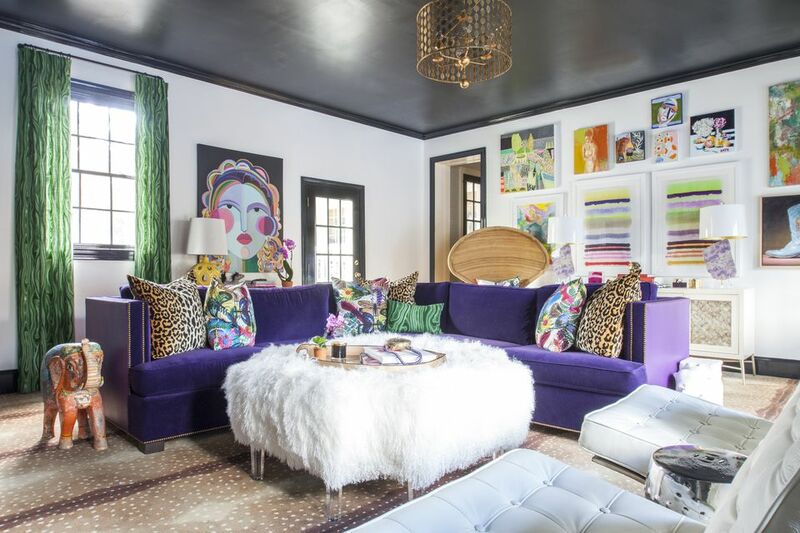 This eclectic, Los Angeles home by Vidal Design Collaborative proves that pretty much every color in the rainbow plays nice with purple. The living room is decked out with a violet sofa with colorful pillows, a one of a kind kilim armchair from Anthropologie, a chevron orange rug, and, cream and yellow curtains featuring a butterfly print. Punching up a kitchen island with a fresh lick of paint is an easy update that does not require a longtime commitment. That is why we love this white kitchen by Christopher Peters. If the violet island starts to feel tired, break out the paintbrush. This idea from Nexus Designs takes mismatched dining chairs to the next level with violet paint. The abstract painting on the wall pulls the room's color scheme together. Bright colors unify all the décor in this Brooklyn townhouse by SPG Architects. In the monochromatic bedroom, a soft shade of violet grabs the helm. Floral curtains add a wallop of violet to a living room by Erica Burns Interiors. The lovely fabric helps to define things by bringing out the yellow, green and purples tones throughout the space. Purple and yellow go together like cookies and cream. But you may not know that vibrant shades of purple like ultra violet pair beautifully with natural wood as shown in this English townhouse by Juliette Byrne London. White walls are a canvas for colorful furniture in a home decorated by Open Ruum Interiors. Layering a neutral rug over a violet as shown is a thoroughly modern way to boost visual interest. Sometimes a small pop of color can enliven an entire room. An excellent for instance is the violet throw that spices up this bedroom by Jay Jeffers Studio. Ultra violet looks amazing with natural wood. The purple vintage tulip chair in this Danish kitchen decorated by Open Ruum Interiors brings a splash of color to the table. Plaid, violet accents lend warmth and personality to a weekend retreat remodeled by Gail Race Interiors. We think that the vibrant bursts of color spiffy up the cream furnishings. In a small apartment by Rebecca Hayes Interiors, a simple sofa and several throw pillows bring out the violet in the painting above. In a modern farmhouse dining room by Hibou Design and Company, six seats in a shade of dusty violet surround a rustic table. Above are two Pythagoras Pendant Lamps in polished nickel by Robert Abbey. A robust color like ultra violet can overwhelm a pale shade. That is why in this living room by Gail Race Interiors the hue is paired with lively shades of green. The explosion of color in this living room by Liz Caan and Company makes our hearts beat faster. A few items worth noting is the gemstone-inspired wallpaper in purple by Phillip Jeffries and the violet area rug with a trellis pattern by Stark. Eye-catching lighting is another fantastic way to work violet accents into your home. Goldrich Interiors brightened this country family home with retro-inspired lampshades in Pantone's color of the year. A sizable Bamileke headdress in deep violet spices up the white walls in this living room by M House Inc. The decorative accessory handcrafted by West African artisans is made up of dyed feathers. Simple designs and clean lines were the objectives for this interior design assignment completed by Carriage Lane Designs. The striking art glass on the wall lends an elegant burst of ultra violet. A colorful rug will instantly update a space. When refreshing this bathroom in a Nashville bungalow, the duo behind Logan Killen Interiors did just that. You may already own several pieces of ultra violet décor. In a lovely living room by Erica Burns Interiors color-coded books turn a white built-in into a colorful focal point. Purple reigns in this splashy space by The English Room. Anchoring the living room is an incredibly inviting L shaped sofa. Adding to the visual coziness is the plush, flokati ottoman.